Here’s Ron Santo’s last card, the only Ron Santo card I own. It will probably look a little jarring to Ron Santo fans, who are accustomed to seeing their affable hero in a Cubs uniform. I can’t recall what my thoughts were on looking at this card for the first time as a seven-year-old, but I was probably captivated by the long run of impressive statistics on the back. The numbers weren’t in quite as small a type as those on the 1975 Harmon Killebrew card that so fascinated me, and the numbers didn’t have peaks quite as high as those on Harmon Killebrew’s card, either, but they were incredibly consistent, even more consistent than Killebrew’s, year after year of 30 home runs and 90 to 100 RBI. I’m sure I also noticed the precipitous dropoff in the last season listed on the card (5 home runs, 41 RBI), and maybe I even saw it as a sign that the man’s long career was coming to a close. I don’t know. In later years I came to understand that Santo’s achievements were even more admirable given that they came in an era when “benchmark” numbers such as 30 homers and 100 RBI were inordinately hard to come by, that the offensive prowess was augmented by consistently stellar glovework at third base (attested to by 5 gold glove awards), and that Ron Santo did all this while managing an illness, Type 1 diabetes, that doctors had predicted would put him in the grave by the time he was 25 years old. He is still alive today, though he has lost both his legs to the disease. He works as a Cub broadcaster, and since I live in Chicago now I listen to him from time to time. He is, by his own admission, an incredibly biased homer for the Cubs, but for some reason I don’t find this as grating as I usually do when having to listen to other renowned homers (such as John “Thuuuuuuuuuuuuh Yankees Win!” Sterling of the Yankees or Hawk “He Gone” Harrelson of the White Sox). Though he doesn’t have the eloquence of the old Mets announcer, Bob Murphy, he does share Murphy’s relaxed, wide open manner, his voice like Murphy’s telling some part deep inside you “Take it easy, partner, you’re safe: It’s summertime.” Or maybe it’s just that he seems like a nice man. Regardless of whether he’s a nice man or not, he is ranked by the foremost expert in such matters, Bill James, as the sixth best third baseman of all time, and the 87th best player of all time at any position, including pitcher. And today, once again, the Veterans Committee of the Hall of Fame neglected to vote him into the Hall of Fame. Today the pompous, arrogant, condescending (why do I keep envisioning the smug visage of Joe Morgan?) Hall of Fame Veterans Committee neglected to vote anybody into their club. Not Luis Tiant. Not Minnie Minoso. Not Gil Hodges. Not Tony Oliva. Not Ron Santo. Yeah, you called it. Tommyrot. Or the eloquence of Bob Murphy. Spent many evenings and afternoons with him. “He rocks and deals….”. Such class. I miss his voice very much. The VC needs to be junked. Stop it. You’re offending Joe Morgan. ballplayer upon his acquisition by the New York Mets. The propensity for any middling Mets prospect showing flashes of ‘potential’ to blossom flamboyantly into stardom in new surroundings. Joe Morgan says he voted for the maximum ten guys on his own ballot, so I guess he’s not to blame for this one. My dislike of him as an announcer must have made me lash out in his direction. Speaking of the Hall of Fame and “Joe Foy Syndrome”: Vince Coleman once claimed that coming to the Mets somehow cost him a spot in Cooperstown. This is also the only Santo card in my collection. 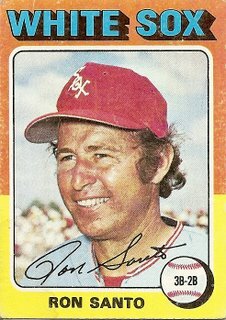 This card always confused me because the same year in 1975 somehow I ate my way to a 3D spectacular card of none other than Ron Santo. But it says CUBS on it not whitesox. I believe it was a kellogs card. The other 3D card that was thumbtacked to my bulletin board was Felix Milan. I can only hope Santo gets into the HOF before the juiced up crowd starts to flood in ruin everything.